The theme of this issue is “Rustic Autumn,” and we’ve gathered a gorgeous variety of textured designs that have a cozy, “log cabin vacation” feel. 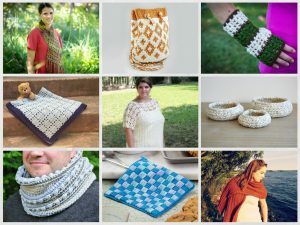 A drawstring bag, a cozy scarf, a filet crochet blanket, and more… there are 11 garments, accessories, and home decor waiting to be crocheted! There are 2 beautiful pattern roundups, and our Tip and Stitch of the Month, too! In this month’s articles, Sedruola gives great advice on organizing your yarn stash, Julie from ACCROchet tells us what styles are trendy this fall, and Kathryn’s Crochet Heals column features a woman who took to crochet after her grandmother passed to carry on her crafting legacy. We also have an exclusive interview with Lena Skvagerson, lead designer for Annie’s Signature Designs! Not a member of Happily Hooked Magazine? Take a closer look at all of your options here. Enjoy the Fall Colors and Happy Crocheting! Big Boy Blanket #10 -- Tools!